Our greatest sense of accomplishment comes from the Maui vacation testimonials our guests are nice enough to share with us. We encourage you to take the time to read what our happy clients have to say about their stays with at Platinum Maui Vacations. This is the second time we have stayed in one of dave’s kapalua golf villas and continue to be impressed with both the quality of the villa and the quality of the service. The unit is beautifully decorated and incredibly well equipped. We love to cook and the kitchen had everything we needed and more. Dave and his wife have thought of everything you might need to have the best vacation ever – from high quality beds and linens to beach chairs, boogie boards and snorkelling gear. The villa is conveniently located being close to the pool and bbq. The Kapulua resort is a perfect spot for golf, enjoying the beach and/or challenging walking/running trails. This is our 5th stay at Kapula and this unit exceeded our very high standards. We will be back. The condo was stunning with a sweeping view of the Pacific ocean when we walked in. Everything worked well and the managers were super responsive when we needed something. I highly recommend this property. The condo has a great location. It was comfortable and tastefully decorated. This was our second visit to the Bay Villas at Kapalua. The unit was spectacular. Everything needed was supplied. The entire unit was spotless and very well taken care of. The view was breath taking and we were able to see a few whales even though it was early in the season. The dining around the unit is second to none. I recommend this property as highly as possible. The property manager is the best I have ever dealt with. – Nice Accommodation. Recent Excellent Remodel. Our host Dave made our check in process easy and quick. The condo was recently remodeled with high quality furniture and tasteful arts, and it was fully equipped. The location of the condo was convenient with some great restaurants and beaches close by. Not to mention the perfect view from a well decorated balcony. I appreciate how Dave’s team made me and my husband feel at home and welcome. I can’t wait to come back again. This was our second stay in this lovely condo. It is modern and beautifully decorated, spotlessly clean, and conveniently located. The condo faces the ocean and overlooks the golf course. We sat out on the lanai each morning enjoying coffee and watching “the hackers!” LOL!! In the evening, the lanai is the perfect place for snacks or dinner and a glass of wine while watching the incredible Maui sunset. The condo is fully stocked with everything you’d need and more! The complex is quiet, and the restaurants on site are so good. It’s easy to get to the beach; chairs, an umbrella, boogie boards and beach towels can be found in the condo. The closest beaches we most enjoyed are Napili Bay and Fleming, both can be accessed within a few minutes in the car, and parking was easy! We’ll be back again and again!! If only we could have stayed longer! The Golf Villas offer gorgeous sweeping views of beautifully landscaped fairways and greens, neighboring Molakai island, bright blue water and skies. At night lounge on the lanai to view a blanket of stars. This tranquil unit is located towards the south end of the development, yet close enough to take advantage of the Ritz Carlton restaurants, Merriman’s, beaches and golf courses. This well furnished 2 bedroom unit had the most comfortable king sized beds! Large beach towels, beach chairs, umbrella and coolers are provided for your use as well. Though we did not use, the complimentary shuttle is a nice perk. We look forward to returning next year! First of all, the condo is in an excellent location. The ONLY downfall is it isn’t on the beach! The view of the Kapalua golf course however is beautiful! We enjoyed watching golfers below while we had a few meals on the patio. It is within a 5-10 minute walk of the wonderful Sea House restaurant (excellent breakfast! ), Napili and Kapalua Bays (some of the best beaches and snorkeling spots! ), Merriman’s restaurant, as well as the coffee shop and convenience store. Beautiful property for taking walks/runs. The condo was beautifully updated and decorated and had all the conveniences of home. The pools were hardly ever being used, although they were in excellent condition/cleanliness. The closest pool was next to this building. I highly recommend staying here! My husband and I stayed in this rental for 3 nights. The size was perfect for our needs. Loved the kitchen, which we used for breakfast and dinners, and it was great to have two bathrooms plus a washer/dryer. We also took advantage of the beach gear, including the cooler for packing water and snacks for our beach time. We’ve stayed in the Golf Villas before (different unit), and the area is quiet and upscale. Great pool choices, and very few people there when we visited. The view from the condo is gorgeous. We loved waking up to those ocean views. Due to the time of year, the lanai got very hot in the afternoon (facing full west). We were able to eat breakfast outside, but afternoons and evenings were just too hot. The one minor inconvenience was that the complex doesn’t allow grills in the units, so we had to use the common area grill by one of the pools. Not too convenient, but not a big deal. Overall, a great place. Dave and Bambi were very professional and made sure we had everything we needed. We would definitely recommend this place and hope to visit again! Dave welcomed us and showed everything within the condo and around. So we had a really good impression of the resort and its facilities. The view is overwhelming especially during the sundowner. The furniture and the kitchen equipment were first class. Everything was clean!! All over… a real great condo. My husband and I stayed two nights at this beautiful condo and it was wonderful. We were greeted by the house manager, Dave, who kindly showed us around, answered our question, and made sure we were all settled in. The apartment was nicely decorated and very clean. It had two bathrooms and a wonderful walk in shower. It had a spacious bedroom with a very comfortable king bed. The kitchen was modern and open. The living room was cozy and our favorite was sitting out on the balcony. The views off the balcony were of mountains, manicured greens lined with beautiful trees, and a view of the ocean off in the distance. 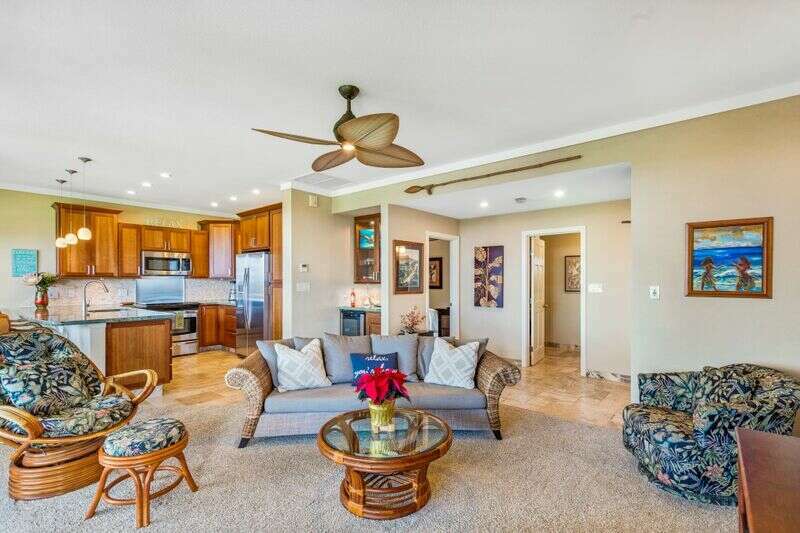 The location of the condo was perfect because you could easily walk to Napili and Kapalua Bay. The condo definitely exceeded our expectations and we absolutely loved it. If we are able to return we know where we’ll be staying again. Spectacular home, the great video and pictures for this listing cannot do justice to the beauty of this home. Dave was a responsive and easy person to deal with ,who we appreciated. This is a home where you are immediately comfortable. It has a spectacular, well equipped kitchen and chairs and boogie boards for the beach. Close to shopping and restaurants, although easier with a car. Yet, away from hustle and bustle of south side of Maui. Great location on the coastal trail. We enjoyed walking that beautiful trail every single day. It is a very comfortable home that is a great place for a vacation. It is also a wonderful space that is very open with lots of views. Beautifully decorated and furnished. Plus, we loved the tempurpedic beds! When we rent a home through VRBO, we rely heavily on the pictures and the listing description to make the selection. Upon arrival at this beautiful villa, you will pleasantly discover that the villa and location are even more beautiful than described in the listing. Equally important, you will discover that the property is overseen by a manager, who pays attention to every detail and customer request. From the beautiful art work, quality design and construction, furnishings and other details, this villa is one of the nicest beachfront properties in Kapalua. We look forward to returning. My wife and I were blown away with this villa. I had been to Maui previously, in fact stayed in the same area. This villa, however, took our breath away with the view, quietness, and convenience of being close to everything. The refrigerator was stocked, and even included my favorite scotch. We spent much of the week sightseeing, but came back to the villa every day. We expect to stay there again soon. Place was absolutely perfect for our family of 5. Dave did a great job of bringing in an additional single bed – that allowed all 3 of my kids to sleep comfortably in the one bedroom. In our 2 trips to Maui, we have visited all over the island, and we believe the Kapalua area is the best by far if you are an active family. We would highly recommend this location! We have stayed at the Kapalua Villas for over 15 years with both family and friends. Mostly on the Ridge side. This year for our 30th anniversary, my wife and I decided to try a Golf Villa and were glad we did. This unit of “Sweet Dreams” was exactly what we wanted. We made this our “home” for two weeks. The views are spectacular. The interior first class. The bed just right! This is definitely one of the Best! We look forward to our return to this very special place. – One of the Best! We were celebrating my 60th birthday. Your place made it the best birthday ever! The views, location, everything we needed, I can’t say enough about it. Luxury at its finest. The only reason I didn’t want to give it a perfect review is because I don’t want it to get booked solid. We will be back. Thanks again Dave, it was everything you said it would be. Loved the unit. Great appointments, larger than we expected, lanai fantastic, ocean view exactly as was presented, only one complaint. The property is so quiet. It could have used the sound of ocean waves piped in through the stereo. Very short distance to several awesome beaches for snorkeling, sunning, people watching. We will seriously consider returning to Hale O ‘aka ‘aka the next time we’re on Maui. Oh, and when we realized we’d booked our flight from the Big Island to the wrong Maui airport (oops) Dave bailed us out. This is our second stay in Platinum property. Both were lovely. The décor honors local heritage and puts you in the mood for an island adventure. The location was excellent, and for the most part, very quiet. We preferred the larger unit as the bathroom is very tight for two in this property. Also, the bedroom is on the east side of the condo and does not have blackout blinds. This means that you will wake early if you are sensitive to light and since it faces the parking lot, headlights of late arrivers may come through as well. We preferred the unit with the bedroom on the golf course side. The balcony on this property is awesome. We spent every morning and evening out there. The owners provided chairs, snorkel gear, and other items for going out and about, which we greatly appreciated. We also were thankful for the chocolates upon arrival, very nice touch. Dave was helpful and available as always! Although we did not take him up on his offer to get our groceries, it was so nice to know that was even an option. He recommended the Hula Girl catamaran and we HIGHLY suggest that as an activity. It is a little more expensive than the rest, but worth every penny. They don’t over crowd the boat, their is ample seating for all, and their food and drink prices are excellent as well as the quality. We love the Honolua store, very reasonable prices there as well, and I did my fare share of comparing. We attended Easter service on the property as well at the local church which was very inviting. Nothing like going to church with the ocean at your back. Dave thanks for use of the villa, it was all the web sites said it would be and in An excellent location. We really fell on our feet when our original rental was cancelled, we have rated you excellent and will gladly recommend you to friends. Hale O ‘aka’aka had absolutely everything we needed. It was a very lovely unit, that is well-appointed and furnished. Dave was incredibly helpful and responsive too! He provided a wonderful welcome pack with really delicious Maui almond cookies. We saw whales jumping all week, impossible to miss. The beach is a short walk down with some of the best snorkeling in Kapalua. The unit comes stocked with beach chairs, towells, all sorts of gear, which is very handy. We had dinner at Merriman’s which was incredible – always is! We did some pitch and putt on the resort and my husband enjoyed 18 holes. Didn’t need the pools, but it was awesome they were there and never busy. We would definitely stay here again and recommend to friends! We stayed in this villa for 6 weeks from the middle of January to the beginning of March. This unit is the best ever of all our Kapalua experiences. The villa has had a beautiful remodel with high end materials. The kitchen is equipped with everything you might ever need. Dave, the manager, is efficient and friendly. We have never had a manager that gave so much time to each villa. He genuinely cares that your stay is wonderful! The view is heaven for golfers….we spent a lot of time on the lanai watching. We could even see the whales in the ocean. The owners obviously want you to enjoy your stay. The villa is outfitted for them, and renters are lucky to be their guests. We booked for next year as soon as we stayed the first night. If you aren’t lucky enough to get this villa, Dave has other high quality units. The condo has everything needed for an enjoyable vacation and it’s a short walk to many good restaurants and great beaches. Another plus, the manager was very responsive and took care of issues promptly. You can watch whales from the lanai and see golfers battle their way up the 10th fairway. Condo is very fairly priced for what it delivers. My husband and I recently spent a week in Maui and stayed in this rental for part of our trip. It was absolutely perfect. We used the kitchen to make smoothies every morning and snacks throughout the day. We also took advantage of all the beach equipment that was provided for our use- the beach chairs and cooler were great extras! The area was great, too. The mellow vibe and amazing weather in Kapalua was so fun and relaxing. We spent the second leg of our trip at a resort in Wailea, and we missed all the amenities of staying in a condo versus a resort! Next time we will try to reserve the condo for our whole trip. Beautiful 2 bedroom condo located right by the golf course. Very spacious and nicely furnished. The shuttle service will take you anywhere around the area and made it very convenient for us to get around. Our host, Dave, was very helpful and stayed at the condo to welcome us even though we arrived at 11 pm. Will stay there again when we head back to Maui. We were fortunate to have this villa for a month (Jan-Feb) and found it to be ideal in all respects. It is very nicely appointed and has the best view in this complex. We stayed here for 12 days in January. This is a wonderful unit with a beautiful view! The bedroom is huge, the tub in the master bathroom was wonderful. The walk-in shower in the master bath is so beautiful! The extra little bedroom is so unusual, but very useful. We had everything we needed in the kitchen, and spent a lot of time on the lanai. Dave and Bambi are so welcoming and accommodating…..Dave is the most impressive manager we have ever encountered! We highly recommend this unit to anyone! – Maui Platinum Vacations Kapalua – absolutely the best!! This villa has been completely remodeled and is as nice a villa as we have ever stayed in. This is our fourth trip to the Golf Villas and we always stay in one of Dave’s units as all of them have been remodeled. Dave is very helpful, if you need any assistance, or just a phone call away just in case. The views from the lanai are beautiful and there is nothing between your view and the ocean except the golf course. Highly recommend this villa for a couple wanting a relaxing getaway. About the Suite and surrounding complex: This has to be one of the best suites in Kapalua Villas – not just in the golf villas but in the entire complex! We have been regular, annual visitors to Kapalua and to the Kapalua Villas for more than 10 years and have stayed in many, many different villas in the Bay, the Ridge and the Golf Villas and this rates up there as one of the absolute best. The view is spectacular and you will find yourself forgoing the many beautiful but often pricey restaurants and bars in Maui to just enjoy the sunset and dinner on your own lanai. But when you do venture out, there is no better location. You are so close to the beach, the tennis club, world-class golf and many of Maui’s best restaurants – Merriman’s, Pineapple Grill, Sansei, Seahouse, are all within walking distance. The complex is fantastic and has a very quiet and private feel to it. The common areas are expertly maintained. The pools and BBQ areas are spotless and everything is in working order. The suite itself is beautiful yet relaxed and comfortable and very well appointed with everything to make your stay fantastic – beach chairs and other gear, great quality towels and linens, a well-stocked kitchen and a wine fridge and bar station. The décor is as lovely as the photos and all of the appliances are new and little touches like toiletries and laundry soap waiting for you that make things easy. About Dave Hailey and Platinum Maui Vacations: We have stayed in several of Dave’s units and have always been taken care of. He takes a personal interest in making sure you are satisfied and enjoy your vacation. Whether it’s making sure your suite is top notch when you arrive to tips and advice on where to go in Maui he is always helpful. And the few times we had had a question or problem (like we can’t figure out how to work the air conditioning or having a problem with a door lock sticking) he was Johnny-on-the spot and immediately took care of it himself or sent someone to help. We highly recommend Dave, and Platinum Maui Vacations for travelers who appreciate high end accommodation and service. – Platinum Maui Vacations is Consistently the Best. We loved our stay in this oceanfront condo at Kapalua Bay Villa. It was a bonus to have the manager Dave available for all queries. He met us at the condo the evening of arrival with a lei, that was a real bonus so communication was great. A really lovely place to call home for 2 weeks. Sensational views, very clean, exceptionally well equipped, tastefully decorated. It just doesn’t get better then that. We would love to stay there again. We couldn’t have been more pleased with our stay in this Kapalua villa. This place was just as advertised and what a view to wake up to each morning. Dave was an excellent host and impressed us with his customer service (lei greeting, groceries, restaurant advice and addressed anything you might need). The villa was great and met all of our expectations. The ability to use the Kapalua shuttle was great for dining, to the beach, or anywhere else on the property. If you are looking for a location away from the crowds, this is it. Be sure to try Merriman’s and find your way to Japengo too. Take the shuttle to The Sea House for their happy hour……who needs dinner with great appetizers, drink specials and the phenomenal Maui sunsets!! Great place to stay and beyond our expectations……will return to this villa for sure. Thanks again Dave for your wonderful hospitality…..you were great to work with through the whole experience. See you for our 25th?? We loved the Golf Villas as a whole, and our unit was perfect for our needs. It was large, comfortably furnished, with a great lanai for having breakfast overlooking the golf course with the ocean in the background. We had our own covered parking spot, right next to the entrance to the condo. The kitchen was spacious and well appointed, including basic staples and condiments. The master suite had a very comfortable king bed, with en-suite huge double shower. There was a second full bath with a single tiled shower and a stacking washer/dryer. The grounds are beautifully maintained and there are several swimming pools to choose from. The property is located within walking distance to several nice beaches, and the unit came with beach chairs, cooler, beach toys, – everything you need for a nice day’s outing. Also within walking distance are the Ritz-Carlton, a great sushi restaurant (Sansei) and the Honolua Store, a great little market that sells most everything you need. We only wish we could have stayed longer.